Conservative Margaret Thatcher was the first woman to become British prime minister when she defeated the incumbent Labour leader James Callaghan on 3 May 1979. In autumn of 1984 the Conservatives arrived in Brighton on the south coast of England for their annual conference. On 19 September 1984 33-year-old Irish terrorist Patrick Magee booked into room 629 of the Grand Hotel using the name Roy Walsh. Over the next 24 days, although posing as a carpenter, he carried the tools of a very different trade into his room. He tore down a wall in the bathroom, planted 13 kg (301b) of gelignite in the space and rebuilt the wall — all without arousing the suspicion of the hotel staff. On Thursday 11 October the Conservative Agents held their ball and Mrs Thatcher popped in before returning to her room at just after 11pm to work on her conference speech. 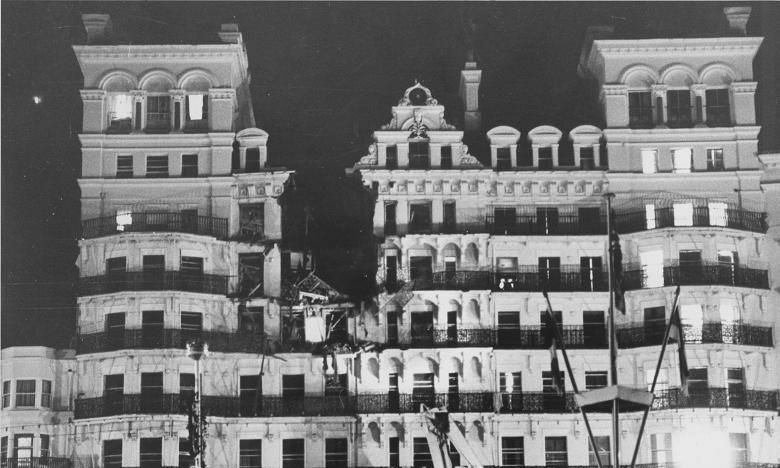 At 2.54am Mrs Thatcher was in the sitting room of her suite on the first floor of the hotel when the bomb exploded. Tory MP Anthony Berry was killed in the explosion, as were four others. Mrs Thatcher and her husband, Denis, spent the night at Lewes Police College. She was due to give a keynote speech at the conference that Friday and went ahead with it, to the delight of the party faithful. The police investigated the 800 people staying at the hotel and accounted for all but one – the carpenter Roy Walsh. The fingerprints he had left behind matched those of IRA member Patrick Magee. He was arrested and on 10 June 1986 sentenced to eight life terms with a recommendation that he serve at least 35 years before he became eligible for parole. In June 1999, he was released after serving just 13 years.